If recent weather is anything to go by then Winter is pretty much over. 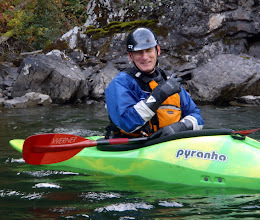 Time then to begin thinking about long evenings paddling on a lake, or drifting between rapids in the warm sun. 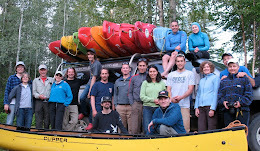 The paddling season in Prince George traditionally begins with sessions in the pool to prepare for the year ahead, and this year is no different. We will be renting the shallow pool at the Prince George Aquatic Centre from 9-10pm every Monday evening starting on March 5th and running into the start of the outdoor paddling season in April. Pool sessions are a great way to dust off your skills and equipment for the rivers and we hope to see many existing paddlers there, especially if you haven't managed to get to any of the informal sessions that have been going on over winter. 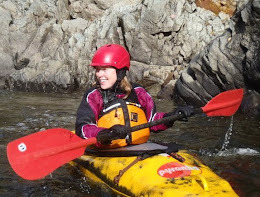 If you are a novice or have never been in a kayak before but have any sort of interest in paddling, whether it's taking on some of the many local rapids, touring on lakes, or simply floating down the Nechako then learning to roll is a key skill that will bolster your confidence enormously on the water. Club pool sessions are a great way to learn the roll since seasoned paddlers will be on hand to offer the benefits of their experience. Costs for pool sessions this year are $25 for the first session which includes club membership for the year and insurance for club events, and $5 per subsequent session. Please note when you attend the pool DO NOT pay the pool entrance fee, just mention the kayak club and pay your fees to the eager-looking gentleman with the kayaks. That's all for now, see you in the pool!